The only way I know to re-enter this correctly is to get a cat to walk across my keyboard. Browser history: Captchas, magnets and optical illusions. Also, sarcasm. Is as strange as my keyboard gets. AGH. I swear, it came out when I entered it. Rats. LOL. I hate the word verification so much. Now they are adding in blurry pictures of faraway numbers on walls and doorways, and expecting us to be able to read that. I can’t even read that when it’s on a REAL doorway! This reminds me of a time when I couldn’t quite make out what the letters were, so I clicked the box that would read it to me… and it read it in Chinese. it doesn’t matter if you don’t get the first word right. The captcha is the second one. 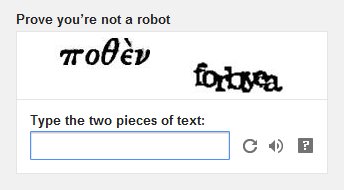 They use two, one for digitalising books (doesn’t matter if you write it wrong) and another one for the real captcha. Thanks for letting me know that! I had no clue.